Yesterday I finished my fourth book, a collection of poems. 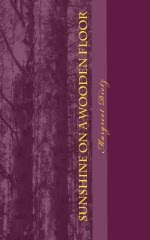 Most of the 28 poems in this 64-page paperback titled Sunshine on a wooden floor I wrote between 2004 and 2006. Topics include love, family, writing, running and immigration. They were written without the intention to publish them. Rereading them now, I think that I am ready for some of these to be read. I am waiting for a proof copy of this book which I expect to be available in June. My first published stories I wrote in the early 1990s for an alumni magazine—all were non-fiction. I remember feeling very excited about writing them and seeing them published with my byline. My first writing I did in diaries. Many of those, mostly haphazard, entries have disappeared during my many moves. One diary that survived is of the first year after I moved away from home at the age of 19 to rent a house with two fellow students. The first entry was on August 23, 1989 and the last one, on the final page of the journal, was on April 23, 1990. It’s the longest continuous diary I’ve kept and that’s probably the best thing about it: the writing is bad. One of my roommates and I also began writing poetry then. We’d take a bottle of wine and a few blankets to the local river in the early evenings and sat along the shore with our notepads, pens, blankets, snacks and cigarettes or roll-your-owns to write. The building of which we rented the top two floors was dilapidated. We spruced up a few walls by adding poetry, including our own, to them with waterproof markers. When I joined the board of the literary group Gheraert Leeu in Gouda in 1994 some of the poems I wrote in university were printed in a home-made bundle along with those by other board members. We read our respective poems at one of the monthly gatherings our group organised, typically for published Dutch authors to discuss their work. I wrote poetry throughout the 1990s. Most revolved around understanding my place in the world and the direction I was headed in. Writing my poems helped me clear my mind by organising my thoughts on paper. Exercise: Describe the first time you acted as a writer, even if you were not conscious of it then. Write about feelings, imagination and/or daily occurrences. Detail what you wrote, dreamt or thought about back then, why, and how it made you feel.